The Audi RS4 quattro is the top tier and highest performing version of some specific generations of the Audi A4 range of automobiles. It is a sports-focused compact executive car (often called sport compact in some countries[which? ]), produced by Audi's high-performance private subsidiary Audi Sport GmbH, in limited numbers, for German car manufacturer AUDI AG, part of the larger Volkswagen Group. It slots distinctly above the Audi S4, as the fastest, most sports-focused model based on the A4's "B" automobile platform. The RS 4 made a comeback in 2012, in Avant form only based on the Audi A4 Avant. 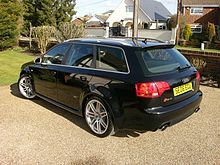 The original B5 version was produced only as a five-door five-seat "Avant", Audi's name for an estate car/station wagon. The second version, the B7, was released initially as a four-door five-seat saloon/sedan, with the Avant following a short while later. A two-door four-seat Cabriolet version was subsequently added. Furthermore, their unique internal combustion engines are all front-mounted, and are longitudinally oriented. The transmission is mounted immediately at the rear of the engine in a longitudinal orientation, in the form of a transaxle, and contains both a center and front differential. The "RS" initials are taken from the German: RennSport—literally translated as "racing sport", and is the Audi marque's highest trim level, positioned above the "S" model specification of Audi's regular model line-up. Like all Audi "RS" cars, the RS4 pioneers some of Audi's latest advanced technology, and could therefore be described as a "halo vehicle". Furthermore, it is only available with Audi's Torsen-based "trademark" quattro permanent four-wheel drive system. Its main market competitors include the BMW M3, Mercedes-Benz C63 AMG, Lexus IS-F and Cadillac CTS-V. The original B5 Audi RS4 Avant quattro (Typ 8D) was introduced by Audi in late 1999, for main production and sale from 2000, as the successor to the Porsche / quattro GmbH joint venture-developed Audi RS2 Avant. The vehicle, like its RS2 predecessor, was available only as an Avant and was built on an existing platform, in this case the Volkswagen Group B5 platform shared with the A4 and S4. Retail price was around DM 103,584. The RS 4 was available for sale in most of Europe, parts of Asia and in some Latin American countries. Audi produced 6,030 units between 1999 and 2001. Although related to the Audi B5 S4, many of the outer body panels were altered, with wider front and rear wheel arches, to allow for the wider axle track on the RS4. With unique front and rear bumpers and side sills, and the rear spoiler from the S4 Avant, the aerodynamic modifications achieved a drag coefficient of Cd 0.34. Although the B5 S4 came in a saloon car body style, the B5 RS4 was only available in the Avant version. Luggage space, measured according to the industry standard VDA method was 390 litres (13.8 cu ft) with the rear seats in the upright position, and 1,250 litres (44.1 cu ft) with the seats folded flat. The engine was developed from the 2.7 litre 90° V6 'biturbo' used in the B5 S4. It displaced 2,671 cubic centimetres (163.0 cu in) and had five valves per cylinder. The parts code prefix was 078 and the identification codes were: early version, 2000 (EU2 compliant): ASJ, and later version, 2000-01 (to EU3 standard): AZR. This engine was developed and manufactured in the UK by Cosworth Technology (now known as MAHLE Powertrain). It featured enlarged intake and smaller exhaust ports on the two Cosworth cast aluminium alloy ALSi7mg cylinder heads, two parallel BorgWarner K04-series turbochargers, two larger side-mounted intercoolers (SMICs), dished piston crowns, stronger connecting rods, larger intake ducting, enlarged exhaust system, and a re-calibrated engine management system. The modifications increased the engine's output from 195 kW (265 PS; 261 bhp) and 400 N⋅m (295 lbf⋅ft) of torque in S4 form to 280 kW (381 PS; 375 bhp) at 7,000 rpm and 440 N⋅m (325 lbf⋅ft) at 6,000 rpm. The engine was controlled by a Bosch Motronic ME 7.1 electronic engine control unit (ECU), using a Bosch 'E-Gas' electronic drive by wire throttle. It had multipoint sequential fuel injection, a MAF, six individual single-spark coils and NGK longlife spark plugs. The engine oil was cooled by a dual oil:water cooler and an oil:air cooler. A six-speed manual transmission (parts code prefix: 01E, identification code: FDP) (gear ratios—1st: 3.500, 2nd: 1.889, 3rd: 1.320, 4th: 1.034, 5th: 0.806, 6th: 0.684), cooled by a NACA duct in the engine undertray, and Audi's Torsen-based quattro system, using the Torsen T-1 "automatic torque biasing" (ATB) center differential, with a 50:50 default bias were standard. Final drive ratio was 4.111. The RS4 has a kerb weight of 1,620 kg (3,571 lb). It can accelerate from 0-100 km/h (62.1 mph) in 4.9 seconds, 0-160 km/h (99.4 mph) in 11.3 seconds, and 0-200 km/h (124.3 mph) in 17.0 seconds. Top speed was electronically limited to 262 km/h (162.8 mph). Brakes were also developed jointly in house by Audi's quattro GmbH, not by Porsche as with its predecessor, the RS2. At the front they were radially vented and floating cast iron discs, 360 mm (14.2 in) diameter and 32 mm (1.26 in) thick, with double-piston floating calipers, and at the rear 312 mm (12.3 in) by 22 mm (0.87 in) discs with a single-piston floating caliper. The RS4 needed less than 50 metres (160 ft) to come to a full stop from a speed of 110 km/h (68 mph). The standard wheels were 18 inch alloys (8½×18" "9-spoke"), with 255/35 ZR18 high performance tyres. Optional "winter" alloy wheels were also available, at 18 inch (7½J×18"), with 225/40 R18 92V tyres. "Sideguard", Audi's curtain airbag system. Xenon High-Intensity Discharge (HID) headlamps. There was no RS4 built on the Audi "B6" platform that served as the basis for the Audi A4 between 2001 and 2005. However, after a long hiatus, the second Audi RS4 quattro (Typ 8E), was built on Audi's "B7" A4 platform, by quattro GmbH in Neckarsulm, Germany. It was unveiled in February 2005 at Audi's 'quattro Night' celebration at the company headquarters in Ingolstadt, Germany. The RS4 became available to European customers in mid-2006. It was introduced at the 2006 North American International Auto Show in January, and arrived in June 2006 in North America. The production run of the B7 RS 4 was 2006 to 2008 inclusive, although only 2007 and 2008 model year were sold in the United States. To date, approximately 10,000 B7 RS4s have been built, of which around 2,000 are in the USA. The B7 RS4 Cabriolet, available in Europe from late 2006 to 2008, was made available as a model year 2008 vehicle in the USA in limited numbers per year (approx 300 total imported)and sold at a premium of $2000 over list. Audi factory numbers indicate that the B7 RS4 saloon can accelerate from 0 to 100 km/h (0 to 62 mph) in 4.8 seconds, and arrive at 0 to 200 km/h (0 to 124 mph) in 16.6 seconds. Most European magazines recorded results in line with the November 2009 comparison of "ultimate sedans", in Road & Track, which recorded a 0 to 60 mph time of 4.5 seconds. This is consistent with the pattern of conservatism that is usually found in Audi's official performance numbers. For the Avant, 0 to 100 km/h (0 to 62 mph) is reached in 4.9 seconds. Top speed for all variants is "officially" electronically limited to 250 km/h (155.3 mph), though some owners have reported that the speed limiter is rather "liberal", conforming to the pattern of previous Audi "RS" cars, with genuine top speeds of 270 km/h (168 mph) being recorded. The B7 RS4 is an almost complete departure from previous Audi "RS" cars, as it was initially available as a four-door five-seat saloon/sedan; with a five-door five-seat Avant (estate/wagon), and two-door four-seat Cabriolet (convertible) versions arriving later. Only the Audi RS6 had taken this similar route (saloon and Avant) before; the previous RS4 and RS2 were available exclusively as Avants. Constructed from fully galvanised steel in a monocoque (unitary/unibody) design, the B7 RS4 uses lightweight aluminium for its front wings (fenders) and bonnet (hood). The saloon version features a drag coefficient (Cd) of 0.31, from a frontal area of 2.17 m2. Like its B5 predecessor, visually, the B7 RS4 differs from its related B7 S4, by having even wider flared front and rear wheel arches (fenders), to allow for a wider axle track. Over the B7 A4, it also includes two larger frontal side air intakes (for the two additional side-mounted coolant radiators). The trim on the saloon and roof rails on the estate are chrome as standard but can also be found in black with the addition of the Optic Pack which includes a black front grill, all exterior trim and black roof rails on the estate version. The B7 RS4 also includes an optional adaptive headlights to complement the standard "Xenon Plus" (Bi-Xenon) High Intensity Discharge (HID) headlamps, which swivel around corners in conjunction with steering wheel movements. Also standard are daytime running lights (DRLs), found within the main headlamp housings, identical to its related B7 A4 and S4, and use a conventional tungsten filament bulb. An acoustic parking system with front and rear sensors is also a standard fitment. Unique carbon fibre interior trims, along with a lap timer within the central Driver Information System (DIS), aluminium pedal caps and footrest, and RS 4 logos complete the look. In the saloon, luggage space, measured according to the VDA 'block method', is 460 litres (16.2 cu ft) with the rear seats in the upright position, and 720 to 833 litres (25.4 to 29.4 cu ft) with the seats folded flat (dependent on specification). For the Avant, 442 litres (15.6 cu ft) is available with the seats upright (under the retractable load cover), and 1,354 litres (47.8 cu ft) being available with the rear seats folded flat (loaded to the roofline). Kerb weight of the saloon variant starts at 1,650 kg (3,638 lb) (dependent on specification). A Bose ten-speaker sound system, with 190 watt output and automatic dynamic noise compensation (which replaces the 'GALA' found on earlier units), with "Concert II" radio and single CD player is standard in car entertainment (ICE) equipment. Factory fitted ICE options to complement the standard BOSE include the "Symphony II" system which features twin radio tuners, a single-slot loading six-CD changer and a cassette player all integrated into a double-DIN sized unit. Navigation option is the RNS-E "Audi Navigation System plus" DVD-ROM GPS satellite navigation, which includes a folding widescreen 6.5-inch screen, two SD-memory card readers, and MMI-like logic control. To achieve maximum body stiffness with controlled deformation crumple zones, the B7 RS4 features laser beam welding of major seams of the high-strength steel body shell, which helps improve overall structural rigidity, particularly in the "passenger cell", over traditional spot welding methods. Two-stage driver and front seat passenger frontal airbags are standard, as is Audi's "sideguard" head protection curtain airbag system. This latter system completely covers all of the side windows, from the front 'A pillar' to the rear "C-" or "D pillars". The body-hugging Recaro shell-type RS race bucket seats (not available in North American markets), complete with electrically inflatable upper and lower side bolsters and adjustable lumbar support, are constructed so as not to need lower side airbags to comply with European crash safety standards. In North America, the only front seats available are the more traditional Recaro seats (identical to those in the B6 and B7 S4), which include lower side airbags; these were also available as a no-cost option in other markets. Lower side airbags are optional for the standard-fit Recaro rear seats. Front, and outer rear seatbelts include pyrotechnic belt pretensioners, whilst all belts include an excess load limit function. The engine of the B7 RS4 is based on the existing all-alloy 4.2 L (4,163 cc) V8 from the B6 S4, and shares many parts, and Fuel Stratified Injection, with the 4.2 FSI V8 engine in the Q7. The engine includes new cylinder block construction, and is a highly reworked, high-revving variant (redline at 8,000 rpm; rev limit of 8,250 rpm). The parts code and version is 079.D and the identification code is BNS. The same engine base was used for the Audi R8 when Audi wanted to build their first supercar. However, the camshaft drive system was moved to the front of the block for the mid-engine R8. The engine has increased crankcase breathing, a low-pressure fuel return system and a baffled oil sump, to prevent engine lubricant cavitation at high engine speeds and high-G cornering. It has four valves per cylinder (instead of five on the earlier variant) and two overhead camshafts on each cylinder bank (so it is 'quad cam') and these are driven by roller chains with variable valve timing for both inlet and exhaust camshafts, along with a cast magnesium alloy fixed tract length intake manifold with adjustable tumble flaps (to improve low engine speed combustion). On 98 RON (93 AKI) Super-Unleaded petrol it produces 309 kW (420 PS; 414 bhp) at 7,800 rpm giving it a specific power output of 74.2 kW (100.9 PS; 99.5 bhp) per litre. Based on a kerb weight of 1,680 kg (3,704 lb), this results in a power-to-weight ratio of 0.184 kW per kg. This engine also produces 430 N⋅m (317 lbf⋅ft) of torque at 5,500 rpm, 90 percent of the total torque being available between 2,250 and 7,600 rpm. (Using lower 95 RON (91 AKI) standard unleaded fuel slightly reduces engine output, and therefore performance, and slightly worsens fuel economy). Exhaust gas escapes through two '4-into-2-into-1' fan-branch alloy steel exhaust manifolds and four high-flow metallic sports catalytic converters, into twin oval tail pipes with integral dynamic silencer/muffler valves. The engine is controlled by two Bosch DI-Motronic MED 9.1 electronic engine control units (working as 'master' and 'slave', because of the high-revving nature of the engine), and uses Bosch 'E-Gas' electronic throttle control (also known as drive by wire), comprising throttle device, accelerator-pedal module, and ECU. The ignition system uses eight individual single-spark coils, using mapped direct ignition, with Bosch single iridium electrode or NGK triple-electrode long-life spark plugs. Ignition timing is monitored with the aid of four knock sensors. The engine complies with the Euro4 European emission standards. The saloon version produces 322-329 grams of CO2 per kilometre (g/km), and the Avant starts from 324 g/km. A 6-speed Getrag manual transmission (parts code: 0A3, identification codes: HLD, JMH) is the only transmission available. The gear ratios are 1st: 3.667, 2nd: 2.211, 3rd: 1.520, 4th: 1.133, 5th: 0.919, 6th: 0.778. The Audi B7 RS4 was the only "RS" Audi powered by a naturally aspirated engine until the Audi RS5 was presented at the 2010 Geneva Motor Show. The RS5 also uses a 4.2 litre high revving V8. The RS5 also dropped the Getrag 6-speed manual in favour of a 7-speed "S tronic" dual clutch semi-automatic. Another focus of the B7 RS 4 was on the introduction of the latest development of Audi's 'trademark' quattro permanent four-wheel drive system. This utilised the 'third generation' asymmetric/dynamic Torsen T-3 'automatic torque biasing' (ATB) centre differential, featuring a 'default' 40:60 front-to-rear torque split under normal conditions. Audi stressed that this would result in a more neutral response in corners, and a more dynamic driving experience. Also, a more aggressive Torque Bias Ratio (TBR) was used, and set to 4:1, as opposed to 2:1 (and later variants 3:1 TBR) on standard A4. That means that one side of the differential can handle up to 80%, while the other side would have to only handle 20% of applied torque. Front and rear axle differentials are conventional "open" types, with a final drive ratio of 4.111. Traction is assisted by way of Audi's "Electronic Differential Lock" (EDL), which is a specific function of the Robert Bosch GmbH ESP 8.0 Electronic Stability Programme system. EDL monitors the rotational speeds of the left and right wheels across an individual axle, and if one wheel should rotate faster than the other (exceeding the pre-defined parameters), indicating loss of traction, or "wheel spin" on one wheel, the EDL applies the brakes to that individual spinning wheel, and thus results in transferring torque across the open differential to the wheel on the other side deemed to have grip, hence traction. Also included in the ESP 8.0 is "Anti Slip Regulation" (ASR)—Audi's name for Traction Control System. The result of all these features is that under normal circumstances (driving straight on dry or even wet road surfaces) the car never loses traction, even when accelerating at full throttle in the first gear. The B7 RS4 also incorporates Audi's "Dynamic Ride Control" (DRC) "Sports Suspension" mechanism. The dampers (shock absorbers) are made for Audi by KW, and central reservoirs/valves made by KYB (Kayaba). In the RS4 suspension, a fluid hydraulic linkage between diagonally opposing front and rear suspension dampers (left front to right rear, and vice versa) is used to counteract vehicle pitch and roll. Lightweight magnesium/aluminium alloy multi-link suspension arms (four arm with virtual steering axis up front, and trapezoidal arm with unequal length track control arms at the rear) locate each hub/brake/roadwheel assembly in a controllable fashion, whilst minimising unsprung masses. Lightweight hollow tubular anti-roll bars are standard front and rear. Compared to standard B7 A4 models, the RS4 features a 30 mm (1.2 in) lower ride height. An optional "Sports Suspension Plus" lowers the car by a further 10 mm (0.4 in), and marginally further stiffens the damper rates. Axle track has also been increased over standard A4s; the front widened by 37 mm (1.5 in), to 1,559 mm (61.4 in) and the rear by 47 mm (1.9 in) to 1,569 mm (61.8 in). Speed sensitive "servotronic" variable-assistance electro-hydraulic power assisted steering (PAS) is controlled from a compact flat-bottomed steering wheel, finished in perforated leather with mock-aluminium trim. The steering rack ratio is 13.1:1, and the turning circle is 11.1 metres (36.42 ft). The standard brakes on the RS4 are of two-piece construction. The cast iron discs are cross-drilled and radially ventilated and float on aluminium alloy disc hubs. The two-piece disc construction reduces unsprung mass and also reduces the transmission of heat generated by the brakes to the wheel bearings. The front discs are 365 mm (14.4 in) in diameter and 34 mm (1.34 in) thick, and use gloss black Brembo monoblock eight-opposed-piston fixed calipers from the Lamborghini Gallardo but with Red/Silver 'RS4' logos. These and the transmission are supplied with a cooling airflow directed from NACA ducts located in the engine front undertray. The rear brakes are drilled, vented and floating 324 mm (12.8 in) by 22 mm (0.87 in) iron discs, with gloss black Lucas-Girling TRW single piston floating calipers with an integrated mechanical handbrake mechanism. A lighter, and higher performing, "Audi ceramic" front brake system was an option from 2007 model year onwards (and only with 19 inch wheels). It comprised cross-drilled, radially vented and floating Carbon fibre-reinforced Silicon Carbide (C/SiC) composite SGL Carbon discs, 380 mm (15.0 in) diameter and 38 mm (1.50 in) thick, with grey Brembo monoblock six-opposed-piston fixed aluminium alloy calipers. The discs have a much greater tolerance to thermal differences, virtually eliminating brake fade, and have a duration of five times greater than conventional iron discs. The ceramic brakes also reduce unsprung mass by around 50% and thereby improve steering response and overall handling. A specifically 'tuned' "sport-biased" Bosch ESP 8.0 Electronic Stability Programme is standard, and includes Anti-lock Braking System (ABS) and Electronic Brakeforce Distribution (EBD), and Brake Assist (BA). This ESP system has three user-selectable settings: the standard default full protection mode, increased slip mode (which turns off the ASR and EDL), and ESP fully off. A useful feature of the ESP 8.0 is 'disc wiping', whereby in wet weather the ESP system applies the brakes frequently but momentarily. This removes water from the disc and pad surfaces, and helps to maintain the braking performance of dry weather. This operation is undetectable by the driver. In the UK and Japan, the standard wheels are 19 inch alloy wheels (9Jx19" ET29 "7-arm double spoke") with 255/35 ZR19 96Y XL (eXtraLoad) high performance tyres. This 19" wheel and tyre package was an option for the North American, and some European markets. Factory supplied tyres included Continental SportContact 3, Michelin Pilot Sport PS2, or Pirelli P-Zero Rosso — although many owners have questioned the load-carrying abilities of the Pirellis (from unexplained sidewall failures and dubious dynamic stability), opting for the more durable Michelins at replacement time. A no-cost option of 18 inch alloy wheels (8½Jx18" ET24 "5-spoke design") with 255/40 ZR18 Y XL tyres was also available, and these are standard in North American markets. A winter wheel and tire package was also available as an option, and included 245/40 R18 96V Dunlop SP WinterSport 3D tyres. A direct-acting Tyre Pressure Monitoring System (TPMS) is standard fitment. This system monitors the pressure in all four tyres every three seconds, and when any loss in pressure is detected, audible and visual warnings are given to alert the driver via the Driver Information System (DIS) in a timely manner. Other notable features to be found as standard equipment on cars for non-North American markets are the smaller, flat bottomed steering wheel (complete with "Sport" button)again selected from the VAG parts bin from the Lamborghini Gallardo like the brakes,however a standard 'multifunction' steering wheel was a no cost option, body-hugging Recaro shell-type race bucket seats complete with electrically inflatable upper and lower side bolsters. The Audi RS4 won Top Gear's Most Surprising Car of the Year in 2005. In 2007, the Audi RS4 was the winner in the "World Performance Car" category of the International World Car of the Year (WCOTY). The new Audi RS4 Avant quattro was launched at the 2012 Geneva Motor Show. It is based on the B8 Audi A4 Avant. No saloon versions of the B8 RS4 were built and it was never exported to North America, which was instead offered only the Audi RS5 coupé that shares the same powertrain as the B8 RS4, with Audi having "succeeded in maturing from the pragmatic but soulless perfection of the early RS5 to a more accessible, more controllable and ultimately more competent Q-car". The B8 RS4 is powered by a 4.2L naturally aspirated V8 producing 450ps and 430Nm of torque. It uses the Volkswagen MLB platform and is only available with the dual clutch S-tronic gearbox configuration, allowing the car to accelerate from 0–60 mph (0–97 km/h) in 4.7 seconds. Compared to the related B8 S4, the RS4 features larger bumper air dams and features a double exhaust tailpipes compared to the S4's double twin (quadruple) exhaust tailpipes. Amongst the options available for the B8 RS4, are ceramic brakes, allowing the car to perform heavy braking without having brake fade. A total of 7000 units of the Audi B8 RS4 were built. Audi RS4 Avant quattro (B8) at the 2014 Geneva Motor Show. Noticeable changes to the B9 included a more angular exterior, newly designed wheels, and a new turbocharged 2.9 V6 engine with 450ps and 600Nm of torque. Unlike the pre-facelift B8 RS4 which had a 7-speed dual-clutch S-tronic transmission, the B9 RS4 is available with an 8-speed torque converter tiptronic automatic. The B7 RS4 was planned to replace the C5 RS6 in the SCCA Speed World Challenge, but after Champion Racing had prepared the car, it was decided not to compete in the series, due to rule changes imposed by the Sports Car Club of America (SCCA) on Audi concerning 4WD systems, wheels size, and engine power output. Rather than scrapping the fully built Speed World Challenge RS4, Champion and Audi used the car as a part of the American Le Mans Series Vitesse Program, which highlights the technology link between race cars and conventional series production road cars. Six RS4s are openly campaigned in the Superstars Series by Audi Sport Italia. Audi RS4 quattro driver Gianni Morbidelli won the 2007 and 2008 championships. ^ "BMW M3 vs. Audi RS4 vs. Cadillac CTS-V vs. Lexus IS-F vs. Mercedes C63 AMG". The Truth About Cars. Retrieved 17 May 2012. ^ "Last Audi RS4 Leaves Neckarsulm". www.audiworld.com. Retrieved 1 April 2019. ^ "Audi Self-Study Programme SSP245 - Audi RS4 (B5)". AUDI AG. 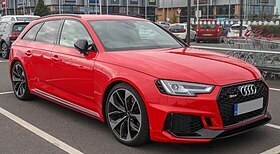 ^ a b c d e f g h i j k l m n o p q r s t u v w x y z aa ab ac ad ae af ag ah ai aj ak al am an ao ap aq ar as at au av "Audi RS 4 Saloon - Technical Data" (MS Word document). AUDI AG. Fortitude.com. February 2005. Retrieved 14 September 2009. ^ a b c d e f g h i j k l m n o p q r s t u v w x y z aa ab ac ad ae af ag ah ai aj ak al am an ao ap aq ar as at au av aw ax ay az ba bb bc "Geneva Motor Show: Audi RS4 - The Sports Car for 365 Days a Year". AUDI AG. VWvortex.com - Audi News. 1 March 2005. Archived from the original on 16 July 2011. Retrieved 14 September 2009. ^ "'quattro Night' - B7 RS 4 world introduction". AudiWorld. AudiWorld.com. 27 February 2005. Archived from the original on 31 December 2009. Retrieved 7 January 2010. ^ Kott, Douglas (2 November 2009). "Ultimate Sedan Comparison". Road & Track. Retrieved 18 April 2010. ^ "2011 Audi RS5 - First Drive Review - Auto Reviews". Car and Driver. Retrieved 17 June 2011. ^ December 2007 PHOTOGRAPHY BY ANDREAS LINDLAHR. 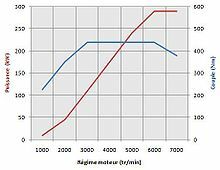 "2008 BMW M3 vs. 2007 Audi RS 4, 2008 M-B C63 AMG Comparison Tests - Page 2". Car and Driver. Retrieved 17 May 2012. ^ quattroholic (14 February 2012). "Audi RS4 Avant (B8) officially revealed". quattroholic.com. Retrieved 6 April 2014. ^ "The Audi RS4 Avant Pricing and Specification Guide" (PDF). Audi UK. January 2014. Retrieved 6 April 2014. ^ Kable, Greg (6 March 2012). "Geneva Motor Show 2012: Audi RS4". Autocar. Haymarket Media Group. Retrieved 12 March 2012. ^ Kacher, Georg (8 August 2012). 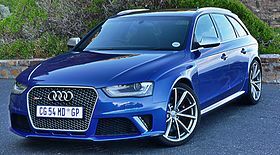 "Audi RS4 Avant (2012) Review". Car. Bauer Media Group. Retrieved 20 February 2018. ^ "Hot Laps at Miller: The ALMS Vitesse Program". AudiWorld. AudiWorld.com. 18 May 2007. Archived from the original on 31 December 2009. Retrieved 7 January 2010. Wikimedia Commons has media related to Audi RS4.